Recently, Pitt has erected a state of the art training and playing facility in partnership with the NFL Steelers. The academic programs at the university are first-rate and its alumni distinguished and supportive. Yet they have been a middle of the pack program for the last twenty years. What many don't recall or realize is that prior to the glory days of the mid-1970's and early 1980's, the program was moribund as the team compiled a 16-56 record, scoring 277 points and giving up a whopping 1014 between 1966 and 1972. Following the stewardships of Dave Hart and Carl DePasqua was former Tennessee great Johnny Majors who had revived the downtrodden Iowa State program. His philosophy of recruiting inordinate numbers of players helped to spark the NCAA scholarship limitations of 85-at-any- one-time and he brought in some great players. After their 1-10 performance of 1972, fans were seeking any positive sign and his 6-5-1 record with a bowl bid seemed great. 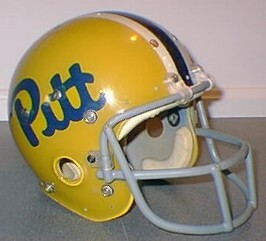 By 1975 and 1976 when our featured helmet was in use, the gold helmets of the "down era" had been replaced by the distinctive shade of yellow that was associated with Pitt football excellence. 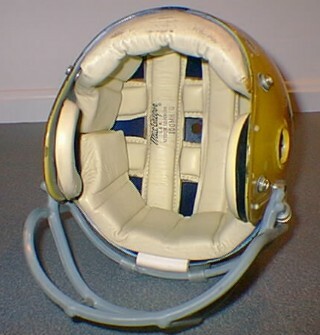 The 1975 record of 8-4 with a Sun Bowl victory over Kansas was followed by the National Championship 12-0 season of '76, led by Heisman Trophy winner Tony Dorsett who set a slew of NCAA rushing records and QB Matt Cavanaugh. 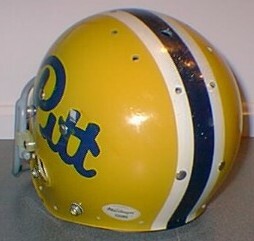 This distinctively padded helmet adorned Dorsett and the first group of Pitt players that eventually took the team to three consecutive 11-1 records under Jackie Sherrill who had replaced Majors in 1977.